I put together the latest on the popular and best ways to shop online in Thailand with free shipping & more. And a top 10 list of Thai ecommerce websites. What’s the best and most popular online shopping site in Thailand? Click here for Lazada Thailand which is the biggest online store. Founded in 2012, Lazada Group is the largest online store in Southeast Asia. It has a seller portal where thousands of Thai businesses sell items. Lazada itself provides a wide range of products directly through their warehouses in Bangkok. Also they have an English language shopping interface over here. The most trusted and popular online shopping site in Thailand. Over 1000 shopping categories from clothes to groceries. Biggest online store with the largest stock of authentic products. Thousands of Thai businesses offer their products through Lazada for greater price competition and even greater availability of items. Cash on delivery (COD) payments, and Visa, MasterCard, PayPal & JCB. Both Thai and English languages are supported. Fast shipping with same day delivery to Bangkok Metropolitan Area. Next day or two day delivery is provided nationwide to locations such as Samut Prakan, Mueang Nonthaburi, Udon Thani, Chon Buri, Nakhon Ratchasima, etc. Please note, that while there are occasional promotions that provide free delivery, this is uncommon. However, cost of courier shipping is relatively cheap. Especially those residing in Bangkok will have the best, modern experience shopping online on Thailand’s top ecommerce site, with their online shopping app. Unfortunately, the website supports delivery to addresses in Thailand only, no worldwide or international shipping is supported on the Lazada store. This is the top 10 ranking of ecommerce companies and their websites in Thailand, based on their popularity on social media (latest statistics from 2018). The Lazada mall however wins with an overwhelming majority with the most extensive coverage with an all-inclusive shopping experience. This top e-commerce brand is known by everyone in Bangkok. Chaiyaphum, Samut Sakhon, Mueang Nonthaburi, Saraburi, Yala, Phra Nakhon Si Ayutthaya, Khon Kaen, Ban Mai, Uttaradit, Phra Phutthabat, Chanthaburi, Kanchanaburi, Surat Thani, Hat Yai, Trang and other locations. That is the biggest nationwide coverage of any online store. What do you think is the best online shopping site in Thailand? 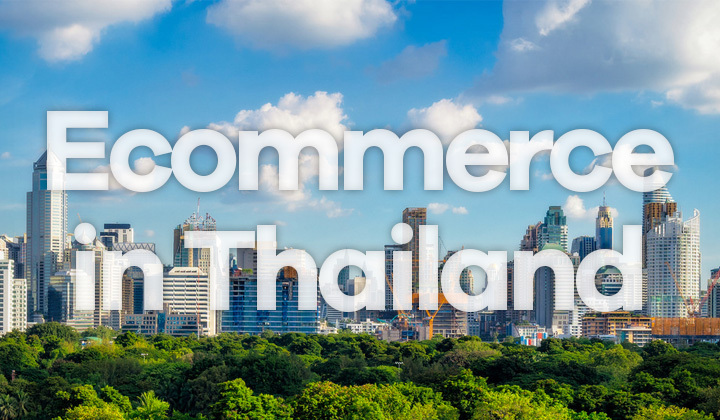 Comments, questions on Thai ecommerce is welcome below. You might also be interested in knowing about a possibility of affiliate links that are placed in various places and posts on this blog. Keeping cookies that track sales that convert to commission is voluntary, and supports my efforts. Massive thanks! And don’t forget to share this post on SN if possible.